Ground hazelnuts in food processor. Pour into separate mixing bowl. In an empty food processor, add rice flour + cold butter. Process shortly, then add it into the same mixing bowl. Dump in flour, sugar and a pinch of salt. Knead the mixture into dough. Divide dough into three equal pieces and roll each piece until it’s ¾ inch round. Wrap in plastic and let them harden in the freezer for 15 minutes or refrigerate for 2-3 hours. Preheat oven to 325ºF. Line baking sheet with parchment paper. Remove the chilled dough and divide each log into 15 pieces each. Roll each piece into spheres. Place on lined baking sheets. Bake for 5-7 minutes. Rotate baking sheet. Bake another 5-7 minutes until lightly golden brown. Let cookies cool completely on baking rack. 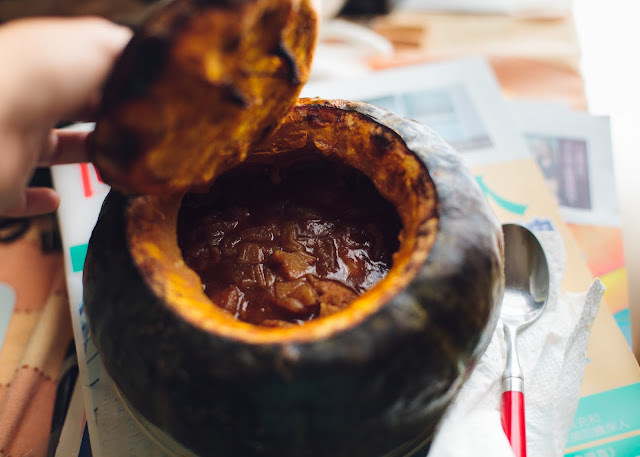 Set a clean, dry bowl over a pot of simmering water. Add chocolate, and stir to melt. 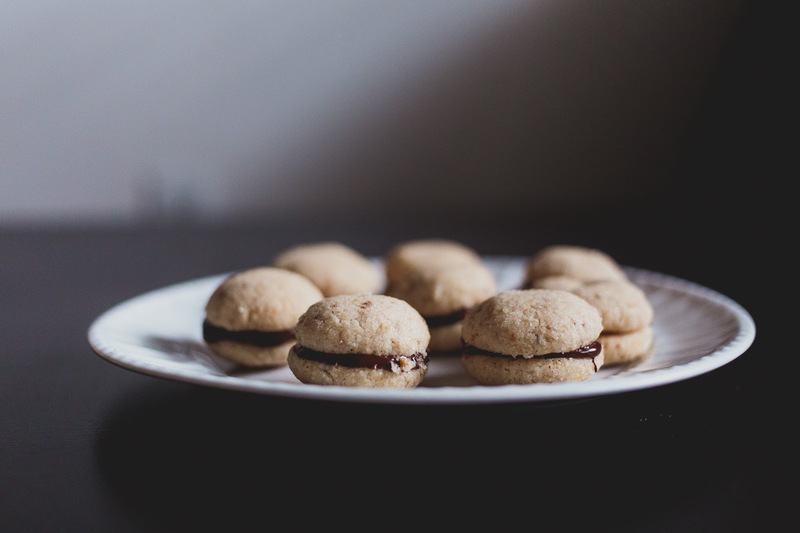 With a spoon or parchment paper cone, dollop a chip-sized amount of chocolate on the bottom of one cookie, and sandwich it with another cookie. 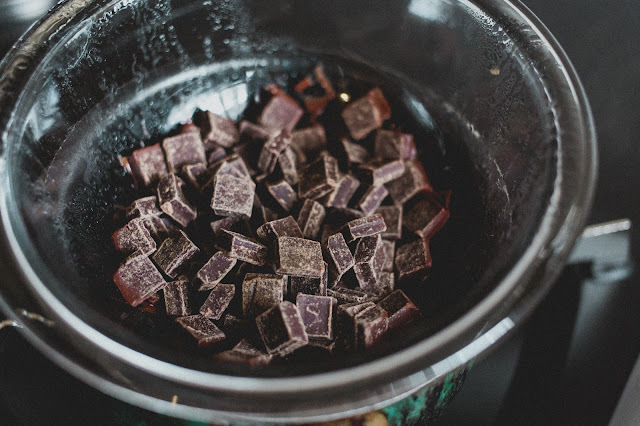 *DIY Blanch & Roast Hazelnuts: Blog Post & Video Tutorial. Brew a cup of coffee or tea, and enjoy! What felt like a month away, turned into a year. 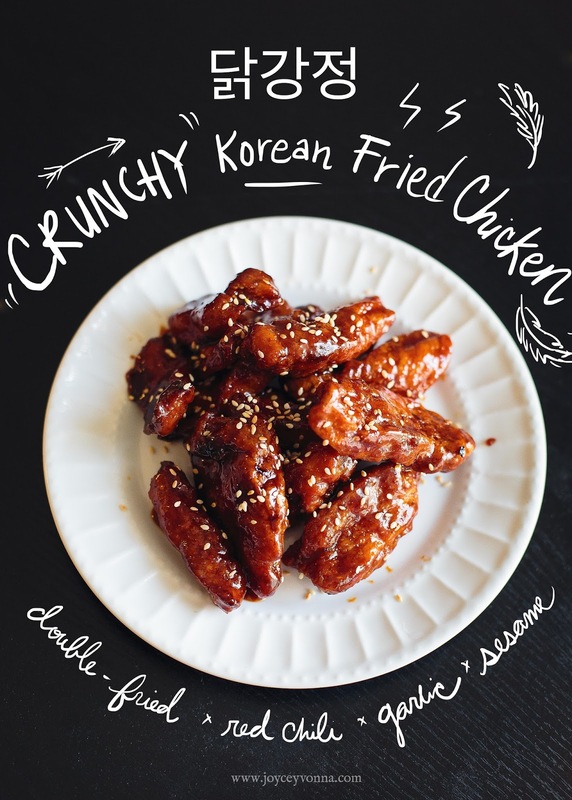 But I'm back to share some more eats! You'll see the latest updates on Instagram; whether it be a nice plate of breakfast, a new video I'm working on or an occasional story. Happy October! 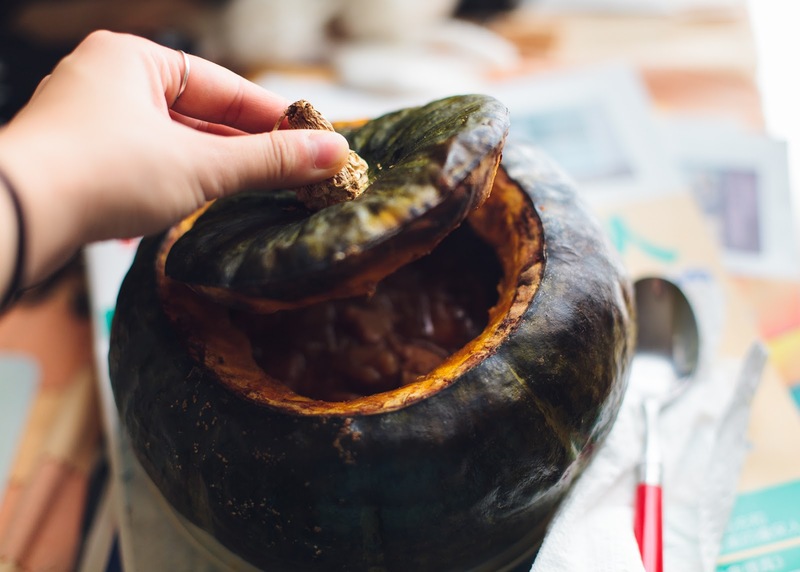 Here's a holiday recipe idea: cooked curry chicken in a baked kabocha squash (Japanese pumpkin). Pyramids! 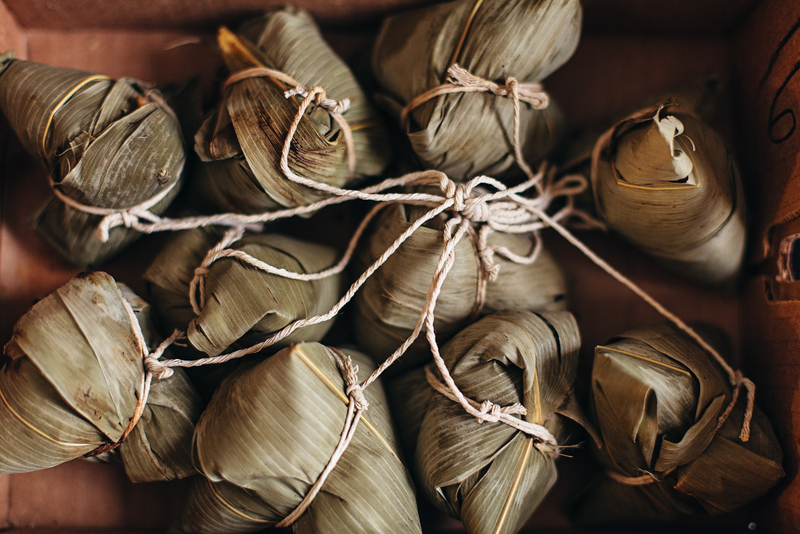 The Chinese way to wrap gifts. 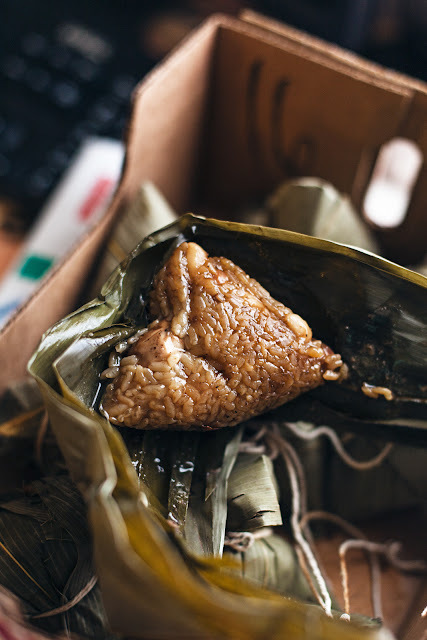 粽子 Zongzi - A traditional Chinese food made of (fried) glutinous rice stuffed with delicious things (this one has tea eggs, chestnuts and taro) wrapped in bamboo leaves. Mmm. Trying a new thing where I doodle on my photographs. I will be honest, I didn't have all the ingredients so my substitute ingredients made this Crunchy Korean Fried Chicken look better than it tasted. But I will give this another try for sure. Followed Video recipe & Written recipe by Maangchi. Many many years ago, there was a 14-year-old girl that didn't own a microwave. She attempted to make mochi using the steam method and failed miserably. Fast forward in time, she got a microwave! She educated herself on how to make these seemingly complex little things, and to her delight, they turned out so nicely she may never buy strawberry mochi from places like Little Tokyo again (not that she ever did). 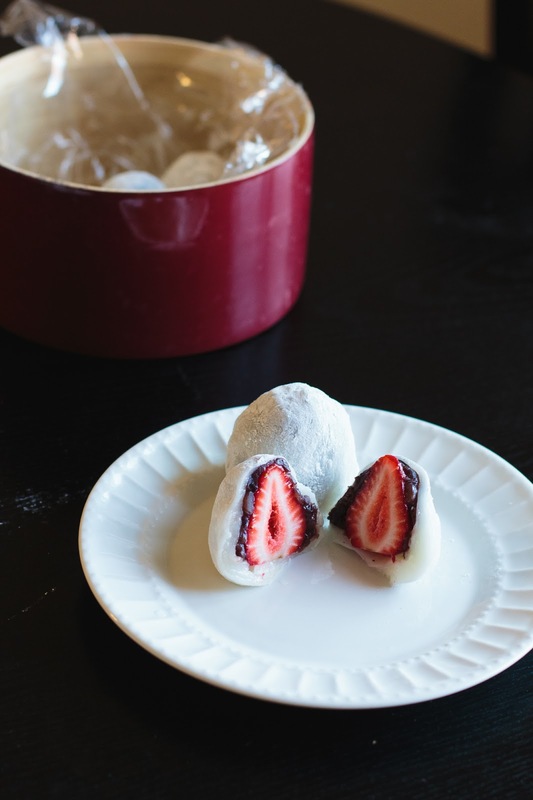 Sharing with you my first attempt at making these delicious little confections, ichigo daifuku. Chop off the green leaves of each strawberry, then wrap each strawberry with enough anko to cover most of the strawberry. Place on a tray and temporarily leave it in the freezer while you make the mochi. In a microwavable bowl, stir together glutinous rice flour & sugar. Slowly add water, mix as you do until consistency resembles heavy cream. Lightly cover with plastic wrap. Microwave bowl for 1 minute. Take it out, stir. Microwave for another minute. Take out, stir. Microwave for last 30 seconds. Take out, dump onto starch dusted surface. 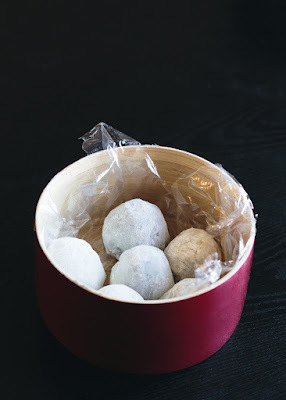 Dust your hands, dust your knife and divide mochi into 6 parts. Stretch each into rounds and place a anko-wrapped strawberry head first into the center of the round. Envelop the strawberry with mochi and pinch to seal the bottom. Keep daifuku dusted with starch to prevent sticking and mold with your hands to configure a nice round shape. Slice in half, and enjoy!